The last time that the RK Khanna Tennis Stadium in Delhi, witnessed such a crowd or perhaps not even then was during the Commonwealth Games 2010 finals when Sania Mirza and Somdev Devvarman had made it to the finals. As soon as the news broke out that Indian Tennis team has drawn Spain for the World Group Play-Offs the anticipation started building up of a possible appearance of some of the biggest names in tennis in Delhi. After all, the Spanish Armada (as the Spanish tennis team is popularly called) comprises of names like Feliciano Lopez, David Ferrer and last but by no means the least- Rafael Nadal. A few weeks ago when the news was confirmed that all these big names, along with Marc Lopez- the 2016 gold medallist at the Rio Olympics in Doubles tournament alongside Nadal, were making their way to the national capital of India, the excitement became palpable. Moreover the entries to the event for the spectators were free. 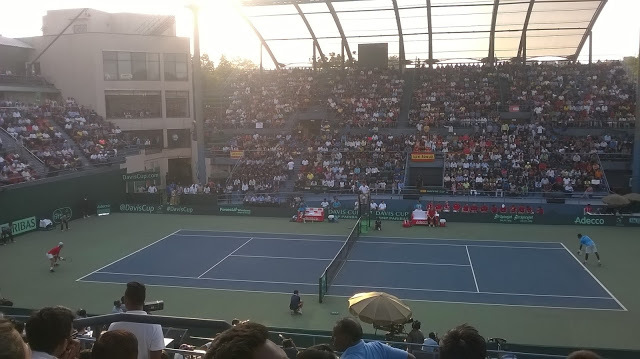 Both the regular tennis fans as well as the people who like to see the big celebrities in sports or otherwise were excited, as witnessed by the huge turnout at the Delhi tennis stadium last evening. But some things are too good to be true. Surely Indian tennis fans were hoping for some upsets when the highly ranked tennis players from Spain were going to face off against the low ranked Indian players -Saketh Myneni, Ramkumar Ramanathan and Leander Paes. But perhaps the upset that nobody had hoped for was that of a different kind- a wrist injury. Nadal who had been practising at the RK Khanna hard courts for the past few days and was scheduled to play in the singles match on Friday as well as in the reverse singles on Sunday, withdrew at the last minute apparently due to an injury in the wrist. Feliciano Lopez replaced him. But people who had come to watch Nadal were not at a complete loss, as the tennis superstar did make an appearance and stayed all throughout the first match played between Lopez and Ramanathan. Each time Nadal greeted the fans with a wave of a hand or a slight smile, the crowds went berserk. It seemed that the energy sapping sun bath that they sat through in the afternoon before the match started, was undone with these sightings. The match too was very entertaining. Feliciano Lopez, the crafty lefty who possesses a huge serve and a neat serve and volley game was always on song throughout the match which ran for more than two hours. Ramanathan’s grit and determination were exemplary though. With an emphatic serving prowess but not as consistent as his Spanish counterpart, Ramkumar enthralled the spectators. With a top spin on his shots, he kept trying in the first two sets to match Lopez in the occasional rallies but could never really penetrate Lopez’s solid defence. With one break in each of the sets, it seemed that Ramanathan despite a courageous showing will wilt under the pressure. In the third set, there was a little twist in the script. Ramkumar’s never-say-die attitude paid off when Lopez’s level dropped for a few moments and as he double faulted in his game and dropped his serve for the first time in the match, Ramanathan got an elusive break and went up by 5-3 in the third set. The consolidation of the break was key, which he achieved as he won the set by 6-3. Ramkumar in his familiar style rallied the crowds behind him. However, as it usually happens, the home favourite underdog could not sustain the energy and the level which saw him through the previous set. In a fast paced fourth and final set, Lopez raised his level many times over and plugged all the holes in his game which lost him the previous set. Soon the set and the match were over and Spain gained a 1-0 advantage in the tie. In other match of the night, one of the most consistent players in the world- David Ferrer stood strong while Saketh Myneni, fresh from his first ever grand slam main draw appearance, crumbled and lost in straight sets. Ferrer who has dropped down to 13th rank in the ATP world rankings, clearly does not belong outside top 10 and his game proved it. His dogged style of play where he does not give up on a single point and a solid defence which he knows how to turn into offence forced too many unforced errors from the Indian number one player. Myneni on the other hand, who is known for his big serve was clearly under the gun as he kept making double faults. It was a match of contrasting styles of play as Ferrer kept stepping deep into the court, directing the pace and direction of the play, while Myneni kept running to and fro far behind the baseline making shots in the rally but never coming out on the top. Indian performance at the Davis Cup in the past few years has been up and down. In the past few years India has consistently been making World Group Play-Off stage but has managed to go past into the World Group stage only once where it lost to Serbia in the first round. This kind of fate is expected for the Indian team as it lacks a strong presence in the singles game. Yuki Bhambri every now and then seems to make progress and headway into the rankings but with injuries plaguing him, fails to keep up the momentum. He has recently announced that he is fast recovering but when will he come back to the competition is still left to be seen. While India has not done well in tennis in the recent past, this was not the case always. In the 60s and 70s Indian tennis was at its zenith with the likes of Vijay Amritraj and Ramanathan Krishnan making it deep into big tournaments like Wimbeldon and India making it to the Davis Cup finals more than once. The players were ranked consistently in the higher rungs of the rankings. But this level of Indian tennis did not last and with the exception of a short lived successful singles career of Leander Paes, which saw him win the US Open junior singles tournament and win a bronze at the Atlanta Olympics, India did not see a breakthrough in the male tennis domain. Sania Mirza’s singles success did reignite interest in Indian tennis but a sustained presence in the higher rankings from a singles tennis player among men or women is still awaited. How to Cultivate a Sports Viewing Culture Without Tournaments? One of the reasons given for the poor growth of Indian sports, or as in case of Indian tennis- a debacle, is the lack of interest of Indian people in sports other than cricket. While this claim may indeed be true, blame partially goes to the lack of infrastructure to cultivate this interest. As cricket has become a big profitable venture for both the corporate world as well as politicians, other games are suffering from neglect. In tennis alone, we see that presently among the highest levels of tournaments conducted internationally, India has a lone event in the form of ATP Chennai Open. In the past decade at different points in time, India had many tournaments to its credit, often at the same time. WTA Bangalore Open, WTA Sunfeast Kolkata Open as well as ATP Kingfisher Mumbai Open were the events which did not survive for long. Whilst the argument can be made that it was due to the lack of public interest or absence of a major breakthrough from the Indian contingent which led to this phenomenon, sustenance of Chennai Open and some such tournaments in other Asian countries falsifies that claim. There are some excellent facilities for tennis and other sports in India which can hold international events. Delhi’s RK Khanna Tennis stadium has successfully organised Commonwealth Tennis tournament, yet still does not host a major tennis tournament on men’s or women’s circuits. The only competitions it holds are at the challenger levels which do not attract the biggest names. In order to cultivate sporting culture among Indian public, they must be exposed to big international names. Going by the huge crowds gathered at the Delhi venue yesterday, to witness Nadal and other Spanish superstars, a feat not achieved in the past many years, it is clear that people are interested in witnessing high levels of performance in competitive formats and not in the wishy-washy exhibition formats like the Indian Premier Tennis League. The tournaments in the past decades which now survive and those which have not, have witnessed names like Nadal, Serena and Venus Williams, Stanislas Wawrinka (a regular fixture at the Chennai Open), Martina Hingis and Marin Cilic. These tournaments have also witnessed Indian ranked players, wild cards and qualifiers such as Yuki Bhambri, Sania Mirza, Somdev Devvarman and Ramkumar Ramanathan proceeding deep and Indian crowds cheering for them. Perhaps chances for competitive sporting action in tennis, except for Chennai Open, should not come at rare moments such as Davis Cup and Fed Cup tournaments to be witnessed by Indian spectators in most parts of the country and we might see better upsets, featuring Indian Davids defeating international Goliaths, rather than just those caused due to the injuries to some tennis stalwarts. PS: While initial reports suggested that Nadal was suffering from an upset stomach, it has been later clarified that this wasn’t the case. It has been informed that he has been suffering from a wrist injury. He will be playing in the doubles match alongside Marc Lopez on day two. Changes have been made in the piece to reflect these developments.